Visible at latitudes between +90° and −75°. Aquila is a constellation. The name means 'eagle' in Latin. The constellation is normally represented as an eagle. Aquila is just a few degrees North of the celestial equator. The constellation is best seen in the summer as it is along the Milky Way. Because of this location along the line of our galaxy, many clusters and nebulae are within its borders. However, they are dim and there are not many galaxies. 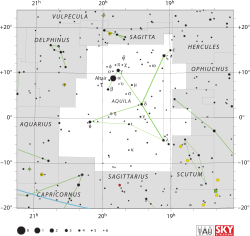 Aquila was one of the 48 constellations described by the 2nd century astronomer Ptolemy. It had been earlier mentioned by Eudoxus in the 4th century BC and Aratus in the 3rd century BC. It is now one of the 88 constellations defined by the International Astronomical Union. The Greek Aquila is probably based on the Babylonian constellation of the Eagle (MUL.A.MUSHEN), which is in the same area as the Greek constellation. Two major novae have been observed in Aquila. The first one was in 389 BC and was recorded as being as bright as Venus. The other was in 1918 and is known as (Nova Aquilae 1918). It briefly shone brighter than Altair, the brightest star in Aquila. NGC 6781 which bears some resemblance with the Owl Nebula in Ursa Major. Aquila, with the now-obsolete figure of Antinous, as depicted in Urania's Mirror, a set of constellation cards published in London c.1825. At left is Delphinus. In mythology, Aquila was owned by the Roman god Jupiter and did many tasks for him. In a book by Gavin White, the Babylonian Eagle carried the constellation called the Dead Man (LU.USH) in its talons. The author also draws a comparison to the Classical stories of Antinous and Ganymede. In Chinese astronomy, ζ Aql is within the Heavenly Market Enclosure (天市垣, Tiān Shì Yuán), and the other stars of the constellation are placed within the Black Tortoise of the North (北方玄武, Běi Fāng Xuán Wǔ). Wikimedia Commons has media related to Aquila (constellation).